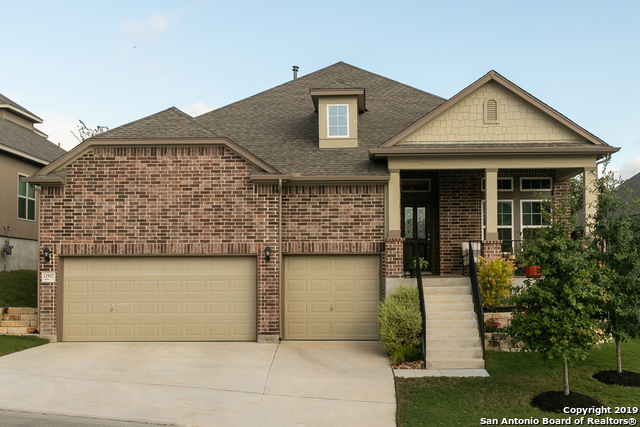 All WESTON OAKS homes currently listed for sale in San Antonio as of 04/22/2019 are shown below. You can change the search criteria at any time by pressing the 'Change Search' button below. "OPEN HOUSE SALE !! 2-5 PM! BIG BONUS! Discounted Home!! 2016 David Weekly home 1 1/2 Story with HUGE upstairs Bonus room! Over 3000 sq ft. Covered Rear Patio with Fans!! Awesome Chef's kitchen with Island and Double Oven!! Walk-In Super Shower!! Bay Window, High Ceilings Private Office, Retreat Bedrooms 2 & 3!! Full Sprinkler System, Formal Dining Room, Spacious 3-car garage Great Amenities!! 2 Pools, Sports Court, Playground & more! SELLER WILL DISCOUNT PRICE OR PAY FOR CLOSING PLUS WASHER, DR"
"Timeless comforts and impeccable craftsmanship come together in the luxurious Morrison. Each upstairs bedroom includes a private walk in closet and plenty of space for unique personality. The gourmet kitchen features a breakfast island and a walk in pantry. Your open floor plan offers soaring 20 ft. ceilings and the freedom to design your ideal living space. The sunlit study is the perfect place for a home library or music studio. Your downstairs master bedroom suite includes a scenic backyard v"
"New Armadillo Homes is ready to move-in. One and a half story home available for move in. 3 bedroom, 2.5 bath with large game room at half story and open concept floor plan. Tile throughout first floor except for bedrooms, bay window at master, large walk-in closets. Granite island kitchen, stainless steel gas appliances and 42 espresso maple cabinets w/crown molding. Community amenities include jr. Olympic swimming pool, kiddie swimming pool, playground, jogging trails, community center and ba"
"2 BEDROOM WITH STUDY AND 2.5 BATHS. SPACIOUS GARDEN HOME WITH TASTEFUL FINISH-OUT. LOTS OF WOOD FLOORING IN LIVING AREAS AND MASTER BEDROOM. NICE UPGRADES. SLOPED CEILINGS IN GREAT ROOM AND DINING ROOM. TRAY CEILING IN MASTER BEDROOM. OVERSIZED WALK-IN SHOWER AT MASTER BATH AND LARGE MASTER CLOSET. BRIGHT AND AIRY." 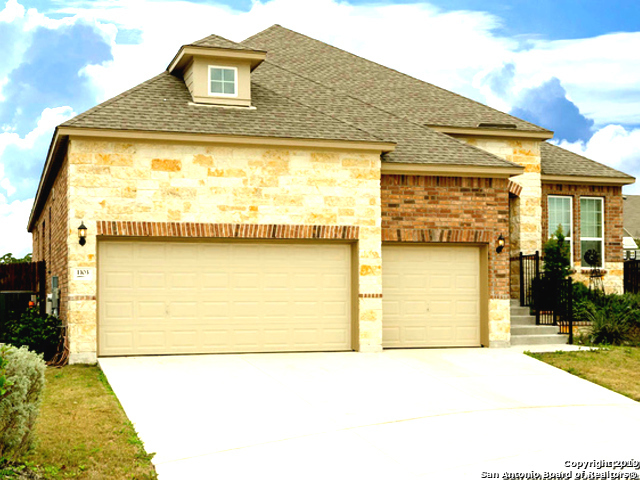 "Beautiful greenbelt home in established Weston Oaks community off Potranco. 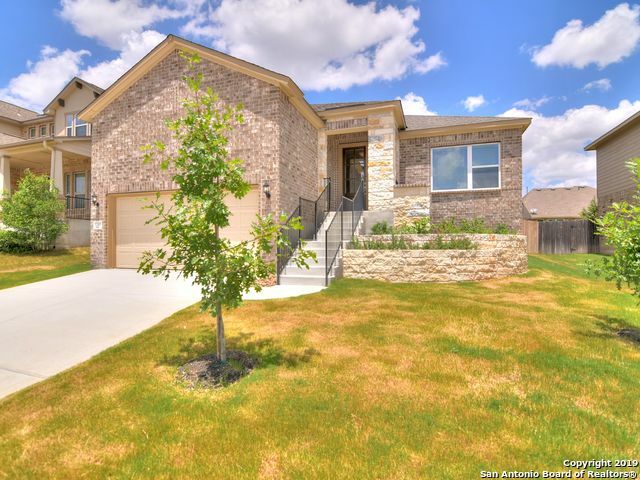 Modern, hill country-style home w/ upgraded features to include wrought iron staircase, granite, backsplash stainless appliances, elegant faucet and fixtures, and tiled flooring throughout the downstairs. Enjoy a bright, sun-filled home office with French Door entryway off your front hallway. Home offers plenty of storage space with a large walk-in pantry & ample built-in shelving throughout. The best feature is the gree"
"This open floor plan can make your home feel larger, even if the square footage is modest. By eliminating doorways and widening the passages to dining and living areas, you obtain a sense of spaciousness that divided rooms lack. In this way, even a smaller, more affordable house plan can offer the spaciousness you seek. Enjoy working from your own home office, entertaining in your gourmet kitchen with gas appliances and huge island, and spending time with loved ones in the open family room." 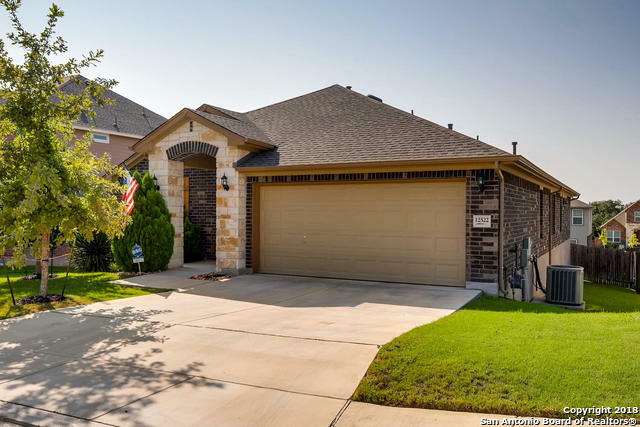 "Amazing one story home close to shopping, schools, and Lackland awaits. Clean as a whistle this 3 bed 2.5 bath has additional study, open kitchen with 42in cabinets, stone backsplash, granite counters with island, pendant lighting. Enjoy the huge front and back covered patios plus deck and pergola, great for quiet mornings or entertaining. 3 car garage has upper storage, and under stairs, mud room, water softener, full sprinkler system. Tile and laminate flooring, and huge master shower, dua"
"This David Weekley home is like new! Open floorplan, two living areas, dining room, breakfast room, family room with fireplace, large kitchen with custom cabinets and granite counters, gas stove, center island with seating and all is open to the family room. Large master bedroom with master bath, walk-in closet and large walk-in shower. There is also a flex room between the 2 guest rooms. Nice covered patio and fenced backyard. 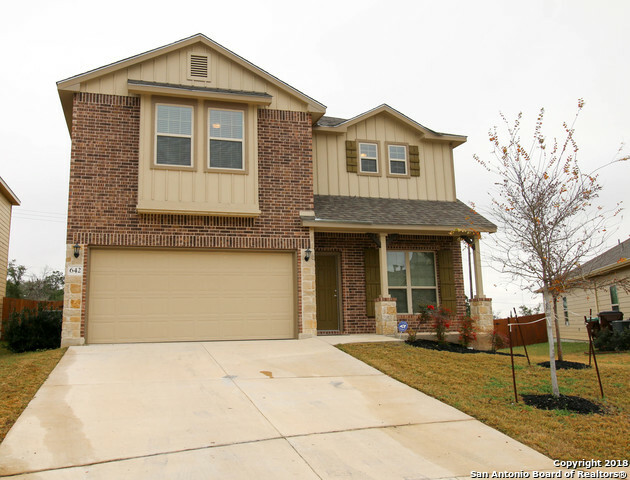 This home is perfect for entertaining or kids.GIVE 1 HR NOTICE"
"Built in 2015, this San Antonio two-story offers stainless steel appliances, granite kitchen countertops, master bathroom with separate tub and shower and granite vanity, multiple bonus rooms, and a two-car garage. Community pool, clubhouse, and park are part of the Weston Oaks HOA." "Beautiful 4 Bedroom, 3.5 bath home located in Weston Oaks. Home was completed in June 2018. Open Floor plan with 4 Bedrooms, lovely island kitchen with granite countertops, recessed light and energy efficient gas cooking. Master bedroom located downstairs. 2nd living area upstairs, backs up to a greenbelt. Great location near schools and much more. This home has a balcony on the second floor and a covered patio in the rear of home." "Better than new 3 year old Armadillo home gently lived in with lots of upgrades. Granite counter tops in kitchen and all bathrooms. Hard tile throughout the entire 1st floor. Very large living area for entertaining. Two eating area for parties and family gatherings. Laundry room located upstairs, along with a perfect size game area or office area whichever fits your needs. Over sized master bedroom with tray ceilings.The neighborhood has great amenities which includes a pool. Motivated Sell"
"CONVENIENCE! Elementary school within walking distance! Huge yard, covered patio. Gas cooking & heat. Island kitchen, 42 cabinets and plenty of them, reverse osmosis separate faucet. Bedrooms are spacious, faux wood blinds, separate utility room, water softener included! 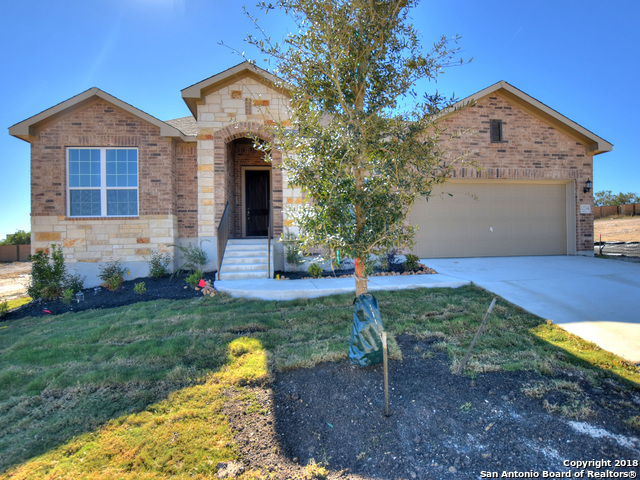 Beautiful David Weekly home in amenity laden Weston Oaks subdivision outside loop 1604, easy drive to shopping, Lackland, Sea World, and downtown San Antonio." 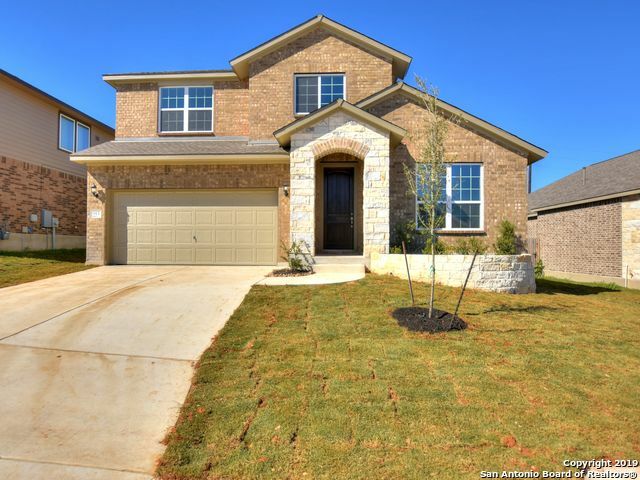 "Magnificent well appointed home close to Lackland, shopping, and all the amenities at the Weston Oaks HOA with pool, playground, and sports courts. 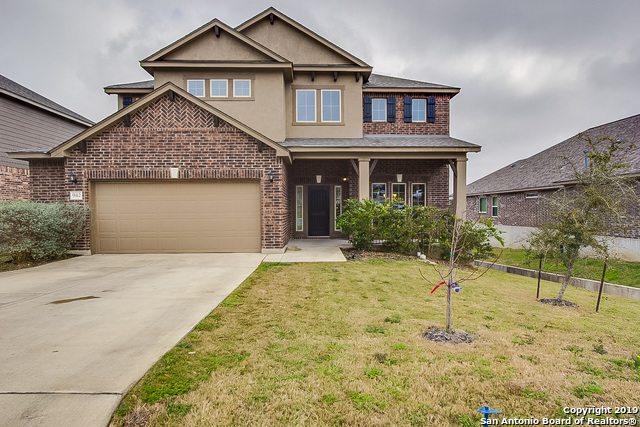 This 3 bed 2.5 bath home has large foyer, which opens to the kitchen with granite counters, tile back splash, breakfast bar, gas cooking and over sized tile flooring. With huge living areas both downstairs and upstairs, no party is too big with the formal dining to enjoy. Back yard is spacious and just added concrete patio." 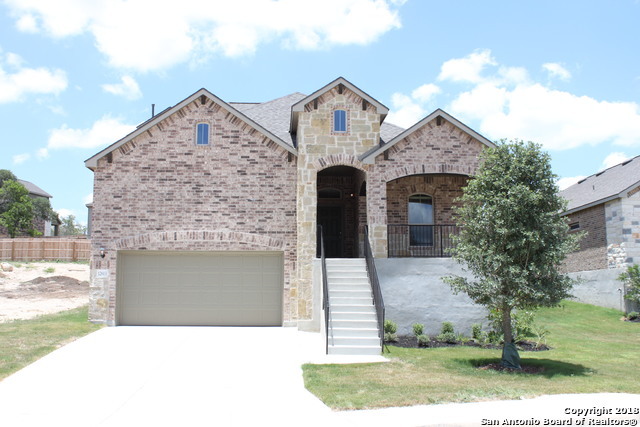 "Built in 2012, this San Antonio two-story offers and a two-car garage. Upgraded features include new carpet in select rooms. A community pool is included as are part of the HOA. Home comes with a 30-day buyback guarantee. Terms and conditions apply."